A briquette (or briquet) is a compressed block of coal dust or other combustible biomass material such as charcoal, sawdust, wood chips, peat, or paper used for fuel and kindling to start a fire. The term derives from the French word brique meaning brick. Coal briquettes have long been produced as a means of using up 'small coal', the finely broken coal inevitably produced during the mining process. Otherwise this is difficult to burn as it is both hard to arrange adequate airflow through a fire of these small pieces, also it tended to be drawn up and out of the chimney by the draught, giving visible black smoke. Early briquettes were large and brick-shaped. They could be stacked, or even built into walls. The Antarctic expeditions of both Shackleton and Scott took large quantities of these briquettes with them and used them to build pony stables. As the ponies were eaten, as planned, for food, the stables could be dismantled and used for fuel. 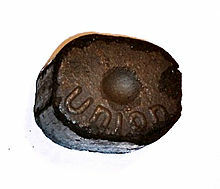 Phurnacite briquettes later adopted a squared oval shape. This regular shape packed well as a good firebed, with plentiful airflow. They are also easy to mechanically feed, allowing the development of automatically controlled heating boilers that could run for days without human intervention. Wax (some brands: binder, accelerant, ignition facilitator). Some briquettes are compressed and dried brown coal extruded into hard blocks. This is a common technique for low rank coals. They are typically dried to 12-18% moisture, and are primarily used in household and industry. Home made charcoal briquettes (called Tadon) were found after charcoal production in Japanese history. In the Edo period, polysaccharide extracted from red algae was widely used as a binder. After the imports of steam engines in the Meiji period, coal and clay became major ingredients of Japanese briquettes. These briquettes,Rentan and Mametan , were exported to China and Korea. Today, coal briquettes are avoided for their sulfur oxide emission. Charcoal briquettes are still used for traditional or outdoor cooking. Woody flakes such as sawdust or coffee dust are major ingredients of modern mass-consumed briquettes (e.g. Ogatan). Ogatan, Japanese charcoal briquettes made from sawdust. High calo tan, Made from coffee dust. Throughout China, cylindrical briquettes, called "fēng wō méi" (beehive coal 蜂窩煤 / 蜂窝煤) or "Mei" (coal 煤) or "liàn tàn" (kneaded coal 練炭 / 练炭), are used in purpose-built cookers. The origin of "Mei" is "Rentan" (kneaded coal 練炭) of Japan. Rentan was invented in Japan in the 19th century, and spread to Manchukuo, Korea and China in the first half of the 20th century. There were many Rentan factories in Manchukuo and Pyongyang. Although Rentan went out of use in Japan after the 1970s, it is still popular in China and Vietnam ("than" coal). The cookers are simple, ceramic vessels with metal exteriors. Two types are made: the single, or triple briquette type, the latter holding the briquettes together side by side. These cookers can accommodate a double stack of cylinders. A small fire of tinder is started, upon which the cylinder(s) is placed. When a cylinder is spent, another cylinder is placed on top using special tongs, with the one below igniting it. The fire can be maintained by swapping spent cylinders for fresh ones, and retaining a still-glowing spent cylinder. Each cylinder lasts for over an hour. These cookers are used to cook, or simmer, pots of tea, eggs, soups, stews, etc. The cylinders are delivered, usually by cart, to businesses, and are very inexpensive. In Ireland, peat briquettes are a common type of solid fuel, largely replacing sods of raw peat as a domestic fuel. These briquettes consist of shredded peat, compressed to form a virtually smokeless, slow-burning, easily stored and transported fuel. Although often used as the sole fuel for a fire, they are also used to quickly and easily light a coal fire. A number of companies in India have switched from furnace oil to biomass briquettes to save costs on boiler fuels. The use of biomass briquettes is predominant in the southern parts of India, where coal and furnace oil are being replaced by biomass briquettes. A number of units in Maharashtra (India) are also using biomass briquettes as boiler fuel. Use of biomass briquettes can earn Carbon Credits for reducing emissions in the atmosphere. Lanxess India and a few other large companies are supposedly using biomass briquettes for earning Carbon Credits by switching their boiler fuel. Biomass briquettes also provide more calorific value/kg and save around 30-40 percent of boiler fuel costs. A popular biomass briquette emerging in developed countries takes a waste produce such as sawdust, compresses it and then extrudes it to make a reconstituted log that can replace firewood. It is a similar process to forming a wood pellet but on a larger scale. There are no binders involved in this process. The natural lignin in the wood binds the particles of wood together to form a solid. Burning a wood briquette is far more efficient than burning firewood. Moisture content of a briquette can be as low as 4%, whereas green firewood may be as high as 65%. The extrusion production technology of briquettes is the process of extrusion screw wastes (straw, sunflower husks, buckwheat, etc.) or finely shredded wood waste (sawdust) under high pressure when heated from 160 to 350 °C (320 to 662 °F). As shown in the table above the quality of such briquets, especially heat content, is much higher comparing with other methods like using piston presses. Sawdust briquettes have developed over time with two distinct types: those with holes through the centre, and those that are solid. Both types are classified as briquettes but are formed using different techniques. A solid briquette is manufactured using a piston press that compresses sandwiched layers of sawdust together. Briquettes with a hole are produced with a screw press. The hole is from the screw thread passing through the centre, but it also increases the surface area of the log and aids efficient combustion. Paper briquettes are the byproduct of a briquettor, which compresses shredded paper material into a small cylindrical form. Briquettors are often sold as add-on systems to existing disintegrator or rotary knife mill shredding systems. The NSA has a maximum particle size regulation for shredded paper material that is passed through a disintegrator or rotary knife mill, which typically does not exceed 1/8” square. This means that material exiting a disintegrator is the appropriate size for compression into paper briquettes, as opposed to strip-cut shredders which produce long sheets of paper. After being processed through the disintegrator, paper particles are typically passed through an air system to remove dust and unwanted magnetic materials before being sent into the briquettor. The air system may also be responsible for regulating moisture content in the waste particles, as briquetting works optimally within a certain range of moisture. Studies have shown that the optimal moisture percentage for shredded particles is 18% for paper and 22% for wheat straw. Briquetted paper has many notable benefits, many of which minimize the impact of the paper waste generated by a shredding system. Several manufactures claim up to 90% volume reduction of briquetted paper waste versus traditional shredding. Decreasing the volume of shredded waste allows it to be transported and stored more efficiently, reducing the cost and fuel required in the disposal process. In addition to the cost savings associated with reducing the volume of waste, paper briquettes are more useful in paper mills to create recycled paper than uncompressed shredded material. Compressed briquettes can also be used as a fuel for starting fires or as an insulating material. Charcoal burners should not be used in enclosed environments to heat homes, as Carbon monoxide poisoning can be fatal. ^ "briquette, n. 2.". Oxford English Dictionary. 2nd ed. 2009. Print. ^ a b c "The Phurnacite plant, the briquette". Aberdare Online. ^ Joe O'Connell. Kingsford Brand Charcoal Ingredients. California Barbecue Association website. Retrieved 11 May 2007. ^ All About Charcoal. virtualweberbullet.com. Retrieved May 11, 2007. ^ "Man died from carbon monoxide poisoning after using 'heat beads' in Greystanes home". The Sydney Morning Herald. Wikimedia Commons has media related to Briquettes. Wikisource has the text of the 1911 Encyclopædia Britannica article Briquette. How charcoal briquettes are made. Holey Briquette Gassifier Stove Development, Richard Stanley, Kobus Venter 14 August 2003 on BioEnergy Lists. Briquetting: An Answer to Desertification, Health Problems, Unemployment and Reforestation in Developing Communities - summary of 2003 seminar.